If you're searching for archery equipment, your search ends at the river with the 3Rivers Archery catalog, the longbow and recurve experts. Use the valuable coupon code to prepare for the hunt with top of the line arrows for archery including arrows for hunting, shooting arrows and masterful bows and bow accessories for pro and beginner archery levels. Enter the Offer Code - CATW - in the Offer/Key Code box at checkout and then click the box below, "Click Here to apply Key Code". Offer applies to retail orders only. Can not be combined with other offers. A Minimum order of $50 is required. Arrows for archery - What was once a historical practice used primarily in hunting and combat, has now become a celebrated, high precision sport. 3Rivers Archery honors the sport of archery by supplying archers and bowmen with a selection of high quality, traditional wood shooting arrows that are crafted from premium wood and perfect for target archery, field archery, 3D shooting and bow hunting challenges! Shooting arrows and traditional arrows for hunting - Traditional Only Carbon Arrows are ideal for those who love the thrill of traditional archery. Carbon arrows are the arrows that traditional archers prefer for their proper weight for pass-through penetration and impressive arrow flight. Order carbon arrows sold by the dozen or six pack, or choose a set of fletched arrows, aluminum shooting arrows, and tools to craft your own custom arrows at home! Bows and bow accessories - Tired of hunting for the perfect bow? 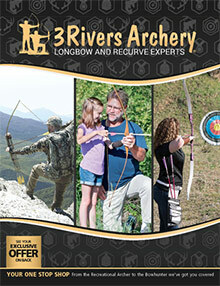 Shop a premium selection of longbows, recurves and youth bows for beginners, all at 3Rivers Archery. Find your perfect bow as well as coordinating accessories including bow cases, strings, quivers, grips, shooting arrows and more! From Primitive bows like the Medieval Huntsman Hunting Longbow to Exotic bows featuring the Magyar Sport, the 3Rivers Archery selection always hits the center of the target! Youth archery - Order youth arrows for archery in colorful feathered styles, then choose from a collection of youth bows, recurves, longbows and bow sets for them to shoot those new arrows off with! Set your mini archers up with kid archery accessories for added safety, protection and easy transport including youth armguards and shooting gloves, small quivers for young bow shooters to carry their shooting arrows in, and shooting tabs that will fit most children from six to twelve years of age! 3Rivers Archery also carries arrows and targets that support NASP - the National Archery in the Schools Program! Arm yourself with the perfect sets of bows and shooting arrows for 3D target shooting or bowhunting. Whether your archery passions lean towards primitive archery, traditional archery or modern archery, archers of all ages will be able to find the equipment and supplies that will take them to the next level, at 3Rivers Archery.